Michael S., Kermo and Vladimir! Congrats, Archer fans, and thanks for entering. Your awesome prizes will be on their way to your mailbox shortly. Enjoy, and thanks again for checking us out at TV Screener.com! And everyone, stay tuned to TVScreener.com … we’ve got lots more TV goodies coming your way! Season two premieres on January 27, and thanks to our generous friends at Fox Home Entertainment, TVScreener.com has three copies of the new Archer: The Complete Season 1 DVD box set to give away to our readers. Archer is set at the International Secret Intelligence Service (ISIS), a spy agency where espionage and global crises are merely opportunities for its highly trained employees to confuse, undermine, betray and royally screw each other. Exclusive DVD extras include the un-aired Archer pilot, “making of” production shorts and deleted scenes. 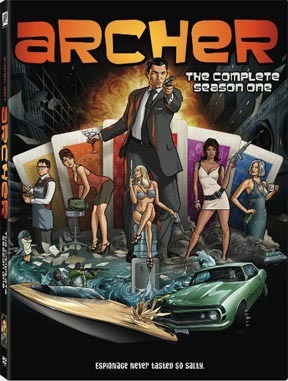 The series features the voices of H. Jon Benjamin (Family Guy) as suave master spy Sterling Archer, whose less-than-masculine code name is “Duchess”; Jessica Walter (Arrested Development) as his domineering mother and boss, Malory Archer; Aisha Tyler (24, Friends) as his ex-girlfriend, Agent Lana Kane; George Coe as his aging-but-loyal butler, Woodhouse; Chris Parnell (30 Rock, Saturday Night Live) as ISIS comptroller and Lana’s new love interest, Cyril Figgis; Judy Greer (27 Dresses, Marmaduke) as Malory’s lovesick secretary, Cheryl; and Amber Nash as Pam, the director of human resources for ISIS. Which star from Arrested Development does voice work in Archer? All you have to do to have a shot at winning the Archer season 1 DVD box set: leave a comment on this post, with the answer to the trivia question above and an e-mail address where you can be reached, and you may be a winner!